Middle school isn’t exactly a walk in the park. Yes, there’s the extremely questionable cafeteria food and the 600 books you have to carry around, but sometimes there’s also bullying, which is something that no one should have to endure. 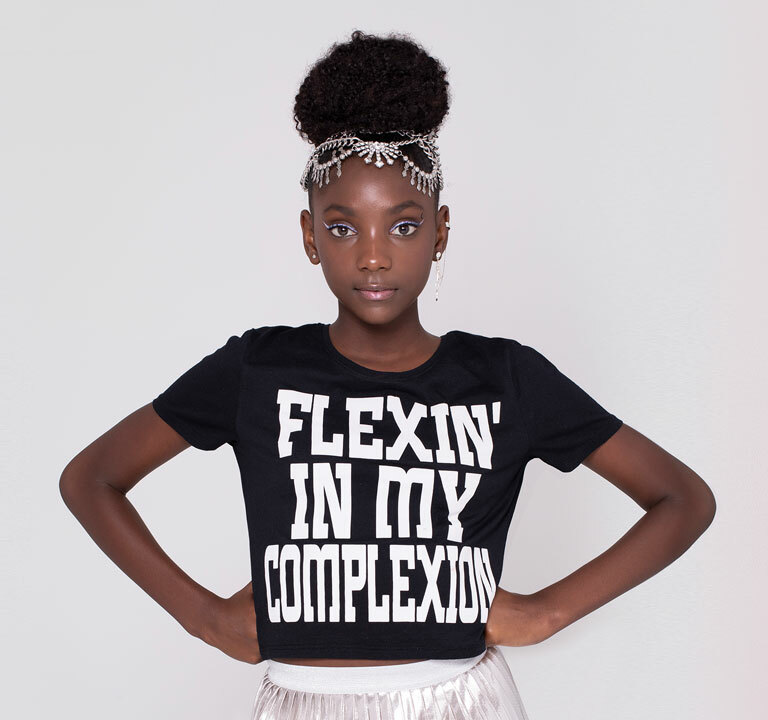 In response to being bullied for her dark complexion, LA-based 12-year-old Kheris Rogers co-founded Flexin’ In My Complexion, a clothing brand dedicated to fighting colorism through Kheris’s love of fashion. We’re all about self-expression (and clothes, too), so we sat down with Kheris to talk about her motivation for starting the brand, her very real glitter obsession, and her hopes for the future. Read on for more, and check out Kheris’s new YouTube channel! 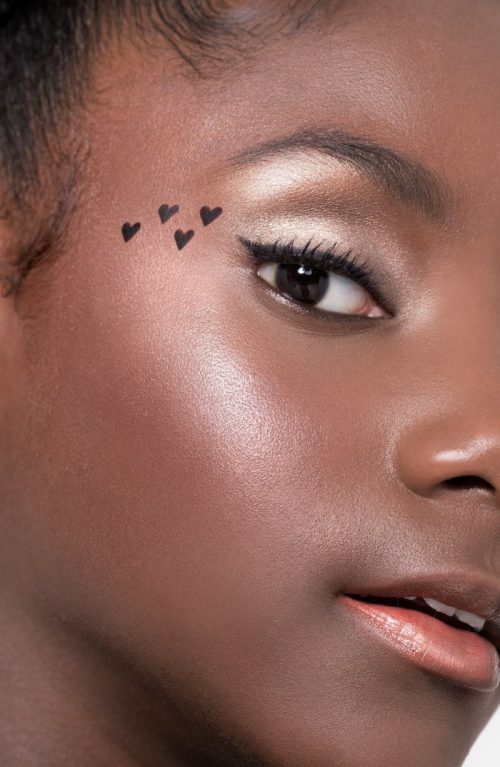 Milk Makeup: What’s the story behind Flexin’ In My Complexion? How did it start? 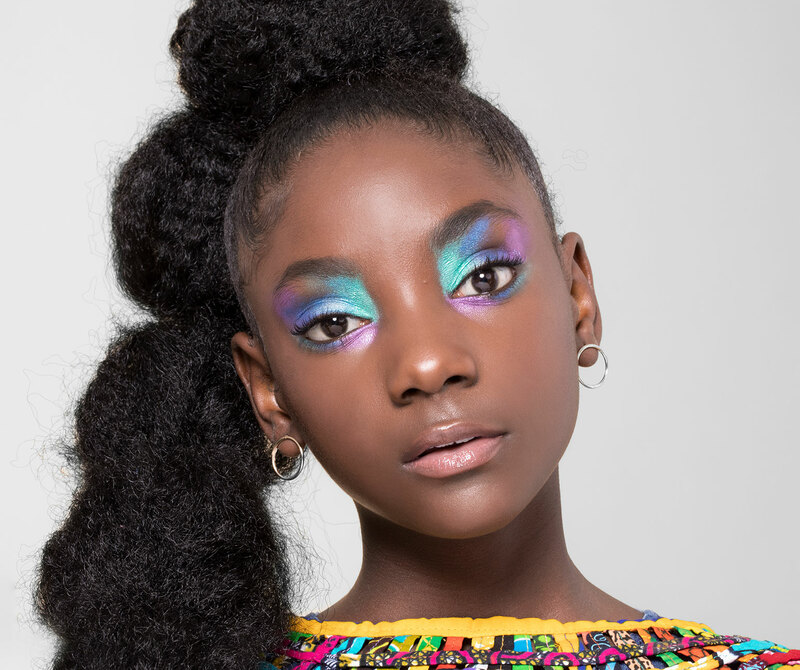 Kheris Rogers: Flexin’ In My Complexion started when I was being bullied for my dark skin. I was always getting teased for the way I looked, but my grandma used to tell us to “flex in our complexion,” and I was like wow, that’s a great saying! So then one year ago, I was in a fashion show and my sister used the hashtag #FlexinInHerComplexion on Twitter and it went viral. I was like, “I went viral? Really? Wow!” I thought she was playing. And then a few weeks later, I realized that I really liked this saying and people really liked the hashtag #FlexinInHerComplexion, so I thought, “Boom. I’m gonna make a clothing line called Flexin’ In My Complexion.” I love the saying and I love fashion, so why not put both together? MMU: What would you say is the biggest challenge and biggest reward of starting your own campaign and business? KR: The most challenging part about running your own company is basically the whole thing [laughs]. I’m still a kid and I don’t know much, but I got an early start and I’m learning so much. It’s hard to pick out what’s going to be on the website because my sister, my mom, and I don’t always agree on certain things, but we still have to work together as a team. The most rewarding part is traveling around the world and speaking to other kids and adults about racism and colorism, and spending time with my family and speaking to each other and sharing our ideas face to face. MMU: What message do you hope reaches people through Flexin’ In My Complexion? KR: I hope people know that it doesn’t matter what others think about you; it’s really what you think about yourself that matters. That’s really what I stand for — self-love, and that’s what I feel Milk Makeup stands for as well. MMU: Do you have plans to grow Flexin’ In My Complexion more in the next year? KR: I would like to expand Flexin’ In My Complexion a lot. That’s what we’re doing now. We also received stuff that was supposed to come out in the summertime pretty late, like backpacks, so we just put all of that up [on the website]. MMU: What are your biggest goal in the next year? Personal and professional? KR: My goal is to make my own clothing store. It’s gonna be all pink, which is my favorite color. MMU: How do you spend your free time outside of being a student and running a business? KR: During my free time, I like to go shopping, obviously, and then I like to go play outside with my friends and go to my best friend’s house. And then more shopping, shopping, shopping, shopping. MMU: How would you describe your personal style? What are your favorite things to wear and shop for? KR: I love sparkles. If you give me anything with sparkles, I will totally wear it. Anywhere I go, I’ll wear sparkles. I also really love bomber jackets. MMU: What would your advice be to people your age who are experiencing bullying? KR: My advice to other people who are being bullied is to not let the words that bullies are saying about you get into your head. They’re down and they just wanna take their anger out on you. Try going to a mirror and say beautiful things about yourself, or get a journal and write positive messages to yourself. MMU: Do you have any role models? KR: My role models are my mom and sister, Lupita Nyong’o, Tyra Banks, Lena Waithe, LeBron James… the list goes on. My mom and my sister gave me this message to put out there. Lupita is amazing; she was in Black Panther, which is crazy. They all inspire me because they’re always speaking out about important things. MMU: You run track; what is it about running that you like? KR: Track is something I do for fun in my free time. I’d like to do competitions, but I really just do it for fun. MMU: You’re starting a YouTube channel; who are your favorite YouTube channels and what kinds of videos do you want to make? KR: Some of my favorite YouTubers are Shalom Blac, Queen Naijah, and CJ So Cool. What I like about YouTube is that you can put out random things and people will just like it, like ASMR — who would’ve thought that things like eating honeycomb and whispering would be satisfying? What I’d like to put out on YouTube are challenges and maybe pranks every once in a while. MMU: What would you say to people your age who want to start something like Flexin’ In My Complexion but who don’t know where to start? KR: Go for your dreams. I started my clothing line when I was 10 and I’m 12 now. You just go for your dream. No one can tell you that you can’t do it because you’re a girl, or you can’t do that because you’re a boy. MMU: Is there something about MMU that speaks to you? KR: The thing that speaks to me about Milk Makeup is that they really stand for self-love. I do, too, and it’s amazing that a makeup company stands for that. I also love holographic stuff, so the Eyeliner in PTO is awesome. Wanna see Kheris’s first YouTube Video? Check it out here.